When I was a student in Chapel Hill, my go-to spots were East End/Deep End (RIP), Lucy's (under new management) and Elmo's (still rockin'). My friends and I didn't make it to many high-end restaurants, partly because of our budgets, but mostly because our world didn't exist past the Eastern block of Franklin Street. As I got older, I realized the number of outstanding restaurants in Chapel Hill, namely a famous one by the name of Crook's Corner. According to their website, Chef Bill Smith is "the only James Beard Foundation 'America's Classic Restaurant' chef ever to have been named a final-five finalist for Best Chef in the Southeast - and twice." Don't be put off by the casual atmosphere and diner vibe - you'll likely pay $30 for a top-tiered restaurant entree. The bar is cozy but ample, and it's a very inviting spot. I'm kicking myself for not going here more when I was a Chapel Hillian! Their cocktail list features the classics done right. 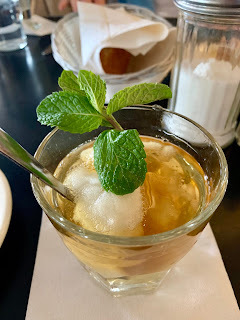 You might order a French 75 (a personal fave), a Sazerac, or how about a modern twist on a Mint Julep: a scoop of Mint Sorbet with Wild Turkey poured on top. I couldn't get enough of this. It was perfectly boozy, perfectly sweet, and it also appears on their dessert menu. I was very torn between this concoction and a Red Hot-Orange Sorbet topped with Reposado and Bubbles. Next time. We were offered crusty bread with butter (always a plus) and while the menu changes often, there are some staples. 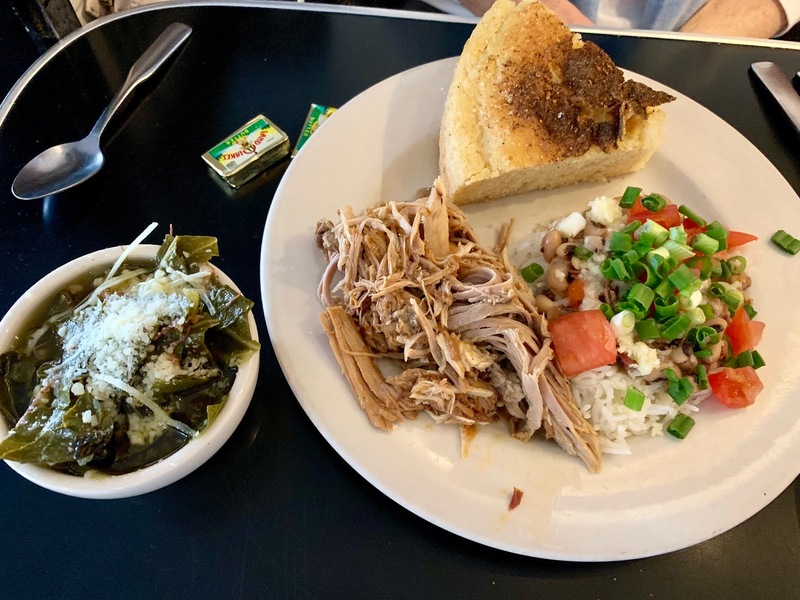 The Carolina Sampler features Barbecue from Picnic in Durham, which was fun to try. The 'cue had great smoke flavor and the Eastern style vinegar sauce that accompanied it was killer. There truly is no better barbecue sauce. My only note for improvement is that this 'cue was pulled, and I prefer chopped. The sampler also comes with tender Collard Greens that had no offensive, earthy flavor - they were awesome. If you don't think you like collards, try these, as they are cooked with bacon and topped with parmesan cheese. The rendition of Hoppin' John featured Black Eyed Peas on a bed of Rice, topped with Tomatoes, Scallions and Cheddar Cheese. It was tasty, but totally upstaged by the other items on the sampler. This all comes with a fat stack of Black Pepper Cornbread - not too peppery and with a hint of sweetness. It was a lovely counter to all the savory notes on the plates. I loved Crook's rendition of Flounder. 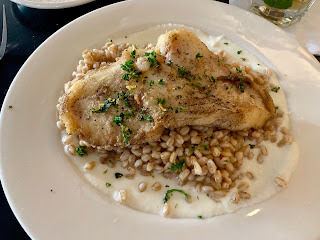 It was thicker than you'd expect, and lightly fried, atop a sweet Onion Puree and Farro. This was an awesomely constructed dish. You get the nuttiness and chew from the farro, the crispy, salty crust on the fish, and the sweet sting of the onion puree. Everything might have been the same color, but it tasted amazing together. Crook's is famous for their desserts, namely what's listed on the menu as "Good Banana Pudding". Let me break it down for you. I was never a banana pudding person until I had the warm banana pudding from Mr. BBQ in Winston-Salem. I'm here to tell you that warm banana pudding will change your life - homemade vanilla custard beats boxed vanilla pudding, and torched meringue beats cool whip any day. 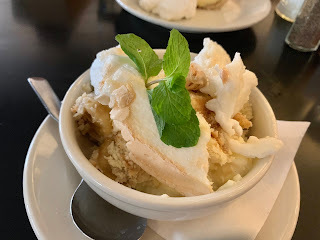 I thought it was interesting that Crook's Banana Pudding featured the elements of warm banana pudding - the homemade vanilla custard and meringue - but theirs is served cold. It was divine and still beats traditional cold banana pudding, but I was very tempted to ask them to microwave it, because that would really be the ultimate. 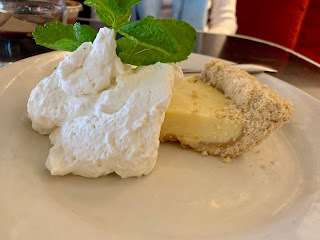 Crook's is also known for their Atlantic Beach Lemon-Lime Pie with Saltine Cracker Crust, an Eastern NC classic that I had never tried until a few days ago. The crust had a perfect salty note (obviously) and the custard was nice and tangy. If you love Key Lime Pie, you will love this. I was really grateful for the opportunity to try so many classic dishes at a famed restaurant in one of my favorite places on Earth. I can't wait to go back and try the Red Hot cocktail and just about every other item on the menu.